Only $120 per Week! Affordable, Super Fun, Reliable Childcare! 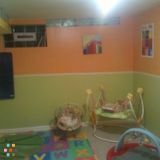 Brand New Home Daycare Facility Open now! 3 TODDLER SPACES STILL AVAILABLE! Capitol Kidz DC is a new Infant and Toddler Learning facility located in Boulevard Heights just 0.5 miles from the Washington DC border. We are within minutes of many DC Metropolitan Areas including Capitol Heights, Forrestville, Suitland, District Heights and Andrews Air Force Base. Capitol Kidz DC is Owned and Operated by a Former Educator, now Stay at Home Mom. At our Daycare we serve 2 Home cooked Meals per day (Breakfast & Lunch) and 2-3 healthy and well balanced snacks. We also have developed a daily educational curriculum to support your childs intellectual growth, socialization and creativity. Children will have the opportunity to play outside in our large, fenced in backyard areas at least 45 minutes to 1 hour everyday, weather permitting. Please call or email for more information or details. We are a family owned daycare with southern values and every child in our care becomes just like one of our own. We would LOVE to have your little one play, grow and learn with us. Plus WE HELP MOMS WITH POTTY TRAINING!! !